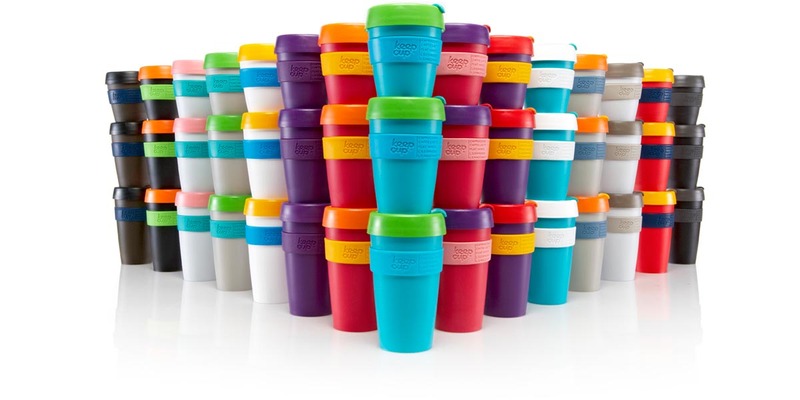 Many people don’t realise most disposable cups are lined with polyethylene and have a polystyrene lid so there is enough plastic in 28 disposable cups and lids to make one small KeepCup. So even though KeepCup is made from plastic – KeepCup is about less plastic. Low embodied energy in manufacture: The resources required to manufacture plastic are relatively low, this means that you only have to use it 15 times to break even with paper cups in terms of the energy manufacture and use. Lightweight and unbreakable: For you to carry our product around it has to be lightweight, ergomonic and unbreakable. Colourful: The ability to choose a unique, personal colourway for yourself increases the desirability of the KeepCup, and increases your likelihood of remembering and reusing. Dishwasher safe: Makes cleaning easy. Recyclable at end of life: The KeepCup is made from single component materials to facilitate recycling at end of life. Polypropylene is being targeted as a great material capable of being recycled into consumer goods. There are lots of clever people doing exciting things in this space. Weight and freight: Being lightweight and stackable has a significant impact on the environmental costs of shipping and freight. The ability to ship components for local assembly also decreases the environmental impact of the KeepCup. We considered glass, because of the excellent recycling properties and the pleasure of use, but the commitment to volume was enormous and the breakeven much higher, 1000 uses compared to 15 for plastic. Visit us in-store at Brunelli’s Perisher Centre or at The Royal Easter Show.